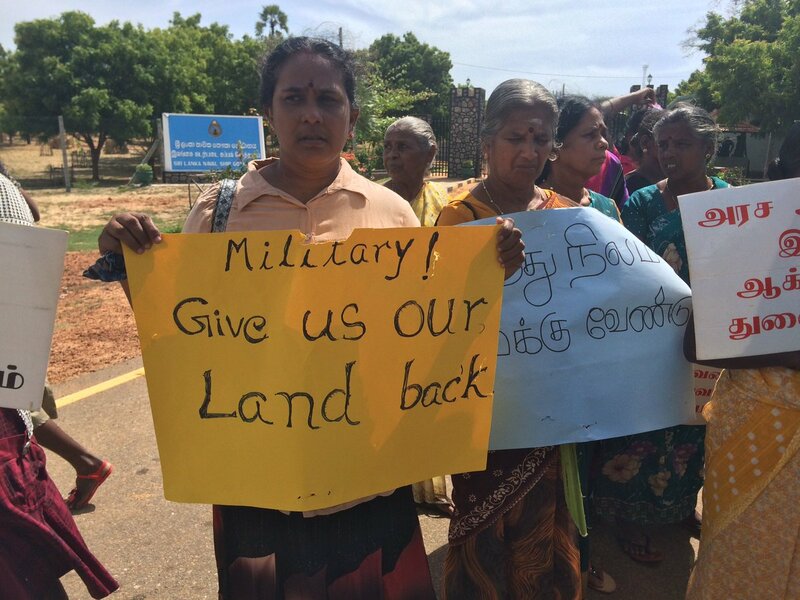 Tamils protest on August 3 against Sri Lankan navy land grabs in Mullivaikkal. Tamils who had been protesting outside a military cantonment in a suburb of Kilinochchi began a hunger strike on September 7. Kumaravadivel Guruparan, a law lecturer at Jaffna University, told a meeting in Melbourne on June 12 that the pervasive oppression of Tamils in Sri Lanka is leading to the "normalisation of abnormalcy". Guruparan was delivering the annual Eliezer memorial lecture, in honour of Professor C J Eliezer, a noted mathematical physicist and campaigner for Tamil rights. University of Jaffna students stage hunger strike in solidarity with fasting prisoners. Photo: Tamilnet.com. Fourteen Tamil prisoners have been on hunger strike since February 22. They are demanding the release of all Tamil political prisoners and prisoners of war. February 4 protest in Vavuniyaa. Tamils in the north and east of Sri Lanka held protests on February 4, the former British colony's independence day. Tamils protest for the release of political prisoners. Colombo, October 2015. When Maithripala Sirisena was elected as president of Sri Lanka in January last year, he promised to end human rights violations by the security forces. Under Sirisena's predecessor, Mahinda Rajapaksa, it was common practice for the army and police to abduct people and torture them. Some were later released, while others were murdered. Why were ASIO-rejected refugees detained so long? Over the past few months, refugees who were once deemed by ASIO to be a threat to national security have been gradually released from indefinite detention. It appears that one of Australia's most internationally criticised immigration detention policies is being quietly abandoned. The most high-profile victims of this policy, Ranjini and her son, who was born in detention and had never known a day of freedom, were released on November 13. About 300 Tamil political prisoners in 11 prisons began a hunger strike on October 12. Many of the prisoners have been detained without trial under the Prevention of Terrorism Act. Some have been in jail for up to 20 years. They are accused of being members of the Liberation Tigers of Tamil Eelam (LTTE), which fought for an independent Tamil homeland in the north and east of the island of Sri Lanka, but was defeated in 2009. The United Nations Human Rights Council has unanimously adopted a resolution called “Promoting Reconciliation, Accountability and Human Rights in Sri Lanka”. This resolution, of which the United States was the main sponsor, welcomed a proposal by the Sri Lankan government to establish a “judicial mechanism” to investigate “abuses of human rights and violations of international humanitarian law”. The Australian Tamil Congress (ATC) has welcomed a September 16 report released by the UN High Commissioner for Human Rights, which "identified patterns of grave violations in Sri Lanka between 2002 and 2011, strongly indicating that war crimes and crimes against humanity were most likely committed by both sides to the conflict". Kokilavany is contesting in the Sri Lankan parliamentary election in 2015 on behalf of the All Ceylon Tamil Congress Party, which is part of the Tamil National People’s Front (TNPF). She spoke to Lalitha Chelliah on Community Radio 3CR's Tamil Manifest program on August 1.